Commissioned for the 2015 Wayzata Select Choir Festival, supported by a grant from the Wayzata Public Schools Education Foundation. Commissioned in 2014 with tremendous joy from a grateful congregation, celebrating over 45 years of worship leadership at Colonial Church, given in service to God by Charles Forsberg. Commissioned by the Rhodes Singers of Rhodes College Dr. William Skoog, Director. Commissioned by the Foundation for Eden Prairie Schools for the Eden Prairie School District Secondary Choirs. Commissioned by First Lutheran Church of Columbia Heights, Minnesota, celebrating 100 years of music and ministry. 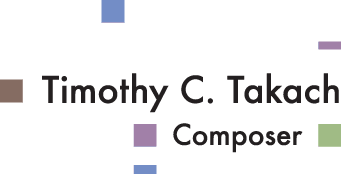 Commissioned for Healing and Hope Through Song, a program of the American Composers Forum, with partial funding provided by Saint Paul Cultural STAR. Commissioned as one of the three finalists in the 2006 Young New Yorker's Chorus Competition for Young Composers. This work was co-commissioned in the year 2012-13 by the American Choral Directors Association of Minnesota and the Minnesota Music Educators Association. Commissioned by Gregory and Maura Harris, in memory of Mary Yolanda Dowling, whose beautiful voice was silenced on September 11th, 2001, and those who perished with her. Premiered by Cantus in 2011. Commissioned by the Kent State University Mens' Chorus, Ben Ayling, Director. Commissioned by Cantus for their 2006-2007 touring season. Where Beauty Comes From (2012) - high voice, piano Written for and premiered by Courtney Huffamn, soprano. Commissioned by Cantus for "All is Calm: the Christmas Truce of 1914"
Published by Neil A. Kjos Music Co.